The Stanley Park Ecological Society (SPES) has released its 2010 State of the Park Report for the Ecological Integrity of Stanley Park. This project emerged following the 2006-07 windstorms. As the Park Board and other community stakeholders began to sort out how to respond to the freshly wind-torn landscape, they realized that there was very limited information on the ecological conditions of the peninsula. SPES undertook this collaborative project to help fill in this knowledge gap. The report includes a bevy of scientific information about the ecology of Stanley Park, courtesy of a number of different research partners, including the Vancouver Park Board, UBC Forest Sciences Department, Parks Canada, and many others. I was pleased to have the opportunity to contribute some environmental history research to the report from my own work on Stanley Park. 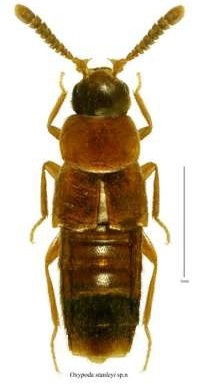 Oxypoda stanleyi, a new species of beetle first discovered in Stanley Park. The report constitutes the most comprehensive scientific study of the environment of Stanley Park and has vastly expanded our knowledge of this place. The extent of this inventorial scientific research is best illustrated by the discovery of two previously unknown species of beetles: Oxypoda stanleyi and Sonoma squashorum. With this new knowledge, however, comes the challenge of applying the findings from this study to future park policy and planning. SPES hopes that the report will “serve as the sound basis for a future Stanley Park Master Plan and provide a step towards the long-term maintenance and restoration of the Park’s ecological health and biodiversity.” This is not the first time in the history of Stanley Park that scientific research has guided park policy, but hopefully this report provides a base of knowledge to help inform better decisions about how we can live, work, and play in this environment.